Name recognition is driving ‘electability’ early in the Democratic primary. Primary voters want a candidate who can win and unite the country to tackle urgent challenges. Pocketbook issues are key to defeating Trump. The Twittersphere bears little resemblance to the primary electorate. For the next 12 months, one question will be looming in the minds of pundits, the press, and campaign operatives alike: What exactly do Democratic primary voters want? With a field that’s shaping up to be one of the largest and most competitive in modern political history, it is all the more important to understand the lens through which those voters will choose who will go head to head against President Trump in 2020. Over the next year, Third Way and David Binder Research will conduct quarterly polls of a national sample of likely Democratic primary voters to help shed light on that question. Our first in the series was conducted one year out from Super Tuesday. While the primary is still nascent, and many things will change before the first voter casts their ballot, one thing is certain from our poll: Primary voters will pick their nominee based on who they believe has the best shot at beating Donald Trump. Our survey shows that the imperative of beating Trump has concentrated the minds of these voters, and electability is the lens for the 2020 primary. Voters want a candidate who can win, and one who will stay focused on urgent challenges, such as reducing the cost of health care, helping out working- and middle-class families, and combating climate change. Primary voters also believe the way to win is to build a broad coalition that can deliver a decisive victory, rather than run a mirror image of Trump’s base-only strategy. At this stage, voters are just beginning to learn about the vast field of Democrats who have thrown their hats in the ring to run for President. But they are already sure about their top priority for the eventual nominee: they want the person who is best positioned to beat Trump. Name recognition is driving the numbers at this early stage. By far, former Vice President Joe Biden is viewed as the most electable of the candidates. His mean (average) electability score is 7.25, and 25% of voters give him a 10 on his ability to beat Trump. Only six percent do not have an opinion on Biden’s electability. By electability score, the margin between Biden and the second-place candidate is around the same margin as between that second-place candidate and the candidate in seventh place. He is a known quantity for voters, and at this point in the early going, he is seen as highly electable versus Trump. The next set of candidates have scores ranging from five to six on the 10-point scale: Senator Bernie Sanders, former Representative Beto O’Rourke, and Senators Kamala Harris and Cory Booker. There is a distinction on name recognition here too, as only seven percent do not have an opinion on Sanders, while 18–26% lack an opinion on the other three, giving them more room to grow (or fall). Voters’ early perception is that these candidates have real potential to beat Trump. Just below that range is a group of four candidates who have electability scores from four to five, which includes Senators Elizabeth Warren, Amy Klobuchar, and Kirsten Gillibrand, along with former HUD Secretary Julian Castro. While the latter three have “don’t know” answers hovering around 30%, Warren has higher name recognition than anyone except Biden and Sanders, with only 13% not able to place her on the scale. These candidates need to become better known or persuade voters they can win. The remaining eight candidates have electability scores of less than four, but on average, 39% do not have an opinion on their electability, so there is significant room to grow those numbers. 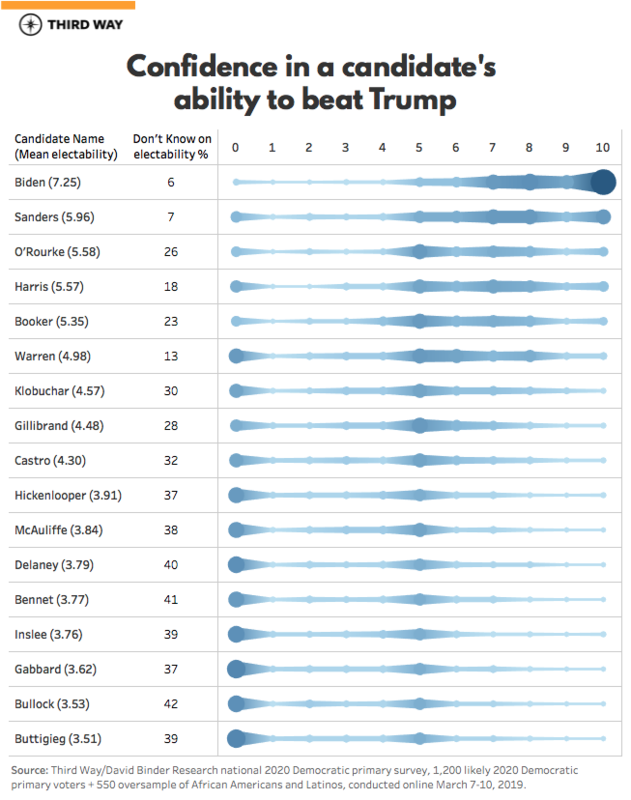 NOTE: This visualization shows responses to the question of how confident are you in [candidate’s name] ability to beat Trump? The darker the shading and larger the marker the greater the number of responses for that option. It is almost certain that perceived electability will shift over the next year, perhaps dramatically, for both the frontrunners and the newcomers. For context, in the competitive Republican primary in 2008, former New York City Mayor Rudy Giuliani led Republican primary polls by 16 points a year before Super Tuesday. He withdrew from the race on January 29th, 2008, having failed to secure a single delegate. Democratic primary voters’ top priority is to find a candidate who can beat Trump. To do so, they believe their nominee needs to build a broad coalition centered on addressing our country’s urgent problems. Across the board, primary voters view Trump as a scourge, and their overriding motivation is nominating a candidate who can beat him. Sixty-five percent want a Democratic candidate with the best shot at beating Trump, while only 28% prefer a candidate most closely aligned with their views on policy. This margin expands among the staunchest partisans; 75% of “strong Democrats” want a candidate best positioned to beat Trump. So how do they think their party can successfully defeat Trump? Primary voters think they need a candidate who can unite the country, not one who will pursue a Trump-style, base-only approach. Seventy percent are looking for a candidate who appeals to a broad range of voters, including those who may have voted for Trump in 2016. Only 22% prefer a candidate who moves left to drive up enthusiasm and participation among progressives and liberals. This preference for appealing broadly over moving left is cross-generational; Millennials pick it by a 28-point margin, while Baby Boomers break that way by 64 points. Only 21% of primary voters say the party should become more liberal to beat Trump. More than twice that number (45%) say the party should shift to be more moderate to win in 2020. To unite a broad coalition, primary voters want a candidate who is laser-focused on the urgent challenges facing our country—not academic or abstract debates. 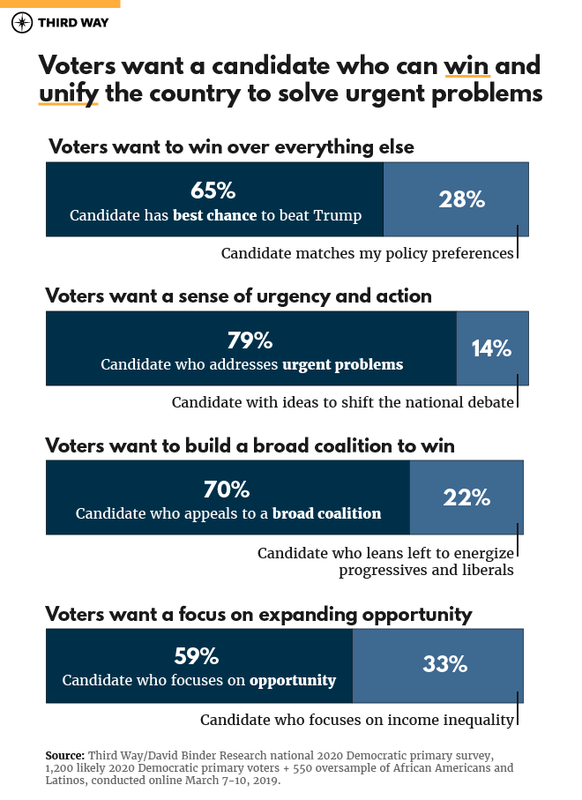 Seventy-nine percent say a candidate should offer ideas to address urgent problems facing people today, compared to just 14% who want a candidate whose ideas shift the national debate but may take many years to accomplish. Democratic women, a vital base of the party, want urgent action to fix current problems by an even wider 81–12% margin. Similarly, 83% of primary voters say they want a Democratic candidate who will work across party lines to bring the country together and get things done, even if it means not getting everything they want. Only 11% would rather have someone who will be uncompromising in their policy stances, standing firm even if it means policies may not be passed. Primary voters’ urgency is driven by the fact that they feel there is an opportunity crisis in this country. Just 27% of voters say a local 17-year-old has more opportunity in their community than elsewhere in the country, while four in 10 say a young person would need to move away to find more opportunity. And for 2020, 59% say they want a candidate who will focus on expanding opportunity to more people and places, while 33% want someone who will focus on reducing income inequality. This desire for a focus on expanding opportunity is broadly felt across geographies; rural voters say to focus on opportunity by 36 points, suburban voters by 30 points, and urban voters by a 17-point margin. What primary voters do not want is a Democratic socialist. By a 32-point margin, voters prefer a candidate who would mend but not end capitalism over a Democratic socialist. Even among self-identified Democratic socialists, who are a small minority of likely primary voters, just 58% want a presidential candidate who is a Democratic socialist. 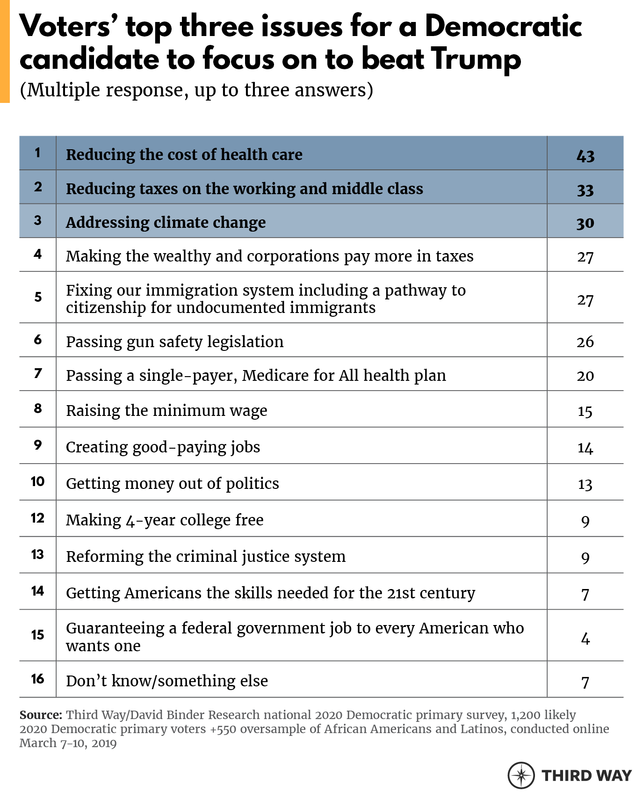 Given Democratic primary voters’ laser focus on winning in 2020, we asked which issues they thought Democrats should focus on to accomplish that goal. They say candidates should prioritize issues that are urgent and impact peoples’ pocketbooks, and they are surprisingly apathetic about proposals advanced by the far left. The number one issue for beating Trump is health care according to primary voters. Forty-three percent say reducing the cost of health care is the issue most important for beating Trump—less than half that number prioritize single-payer Medicare for All. For most primary voters, the former addresses a daily anxiety while the latter is an abstraction (at best). Next on the list after health care costs is putting more money in people’s pockets: 33% say reducing taxes for working- and middle-class families is vital (another 27% say the same about making the wealthy and corporations pay more in taxes). Primary voters’ third priority is climate change; 30% say it is central to beating Trump. Democrats must win by building a multiracial coalition, and importantly, there is general consensus across racial lines on the top issues for defeating Trump. White, black, and Latinx voters all rate reducing the cost of health care as the top issue for toppling Trump. Cutting taxes for working- and middle-class families is priority number two for black voters, number three for whites, and number four for Latinxs. The biggest divergence is on climate change; it is the number two issue for whites and number three for Latinxs, but number nine for black voters. Outside of the three issues that popped across the board, Latinxs’ number two issue is immigration reform and black voters’ number three issue is gun safety legislation. On the flip side, voters do not believe proposals associated with the far left provide a path to victory. Just 20% of voters say single-payer Medicare for All is a top issue for beating Trump, nine percent say free college, and four percent list a federal jobs guarantee. Among self-identified liberals, these proposals still fall flat; only 25% pick single-payer Medicare for All, 11% free college, and two percent a jobs guarantee. Instead, they prioritize mainstream Democratic ideas like reducing the cost of health care (38%), addressing climate change (38%), and making the wealthy and corporations pay more (31%). When asked to choose between competing proposals, primary voters favor capping health care costs and covering everyone over single payer (44% to 32%), ensuring higher education provides a return on investment over free college (49% to 35%) and public-private job creation over a federal jobs guarantee (69% to 17%). There is no appetite, even among primary voters, for fringe issues like abolishing ICE; in fact, when asked what message they want to send on immigration with their vote, more primary voters say, “build the wall” (seven percent) than “abolish ICE” (four percent). Seventy-three percent of Democratic primary voters do not post on Twitter—and only one in 10 post daily. What Democratic politicians, operatives, pundits, and Extremely Online people read and internalize on Twitter are the views of a small minority—a minority that is in no way representative of the Democratic coalition (or even the primary electorate). Anyone who conflates the Twitter echo chamber with real life will find themselves far outside of the mainstream of what Democrats are looking for in 2020. On several important questions, we found a 20- to 30-point gap between what people who post on Twitter support, compared to people who do not post on Twitter, with those engaging online being far more ideologically driven and rigid. On the question of whether Democrats want a candidate who will appeal to a broad range of voters or move left to energize progressives and liberals, voters who do not post on Twitter prefer broad appeal by 57 points, while active Tweeters prefer broad appeal by a much narrower 27 points. On health care policy, voters who do not post on Twitter pick a plan that limits out-of-pocket costs and covers everyone over single-payer Medicare for All by 18 points, while active Tweeters are evenly split. 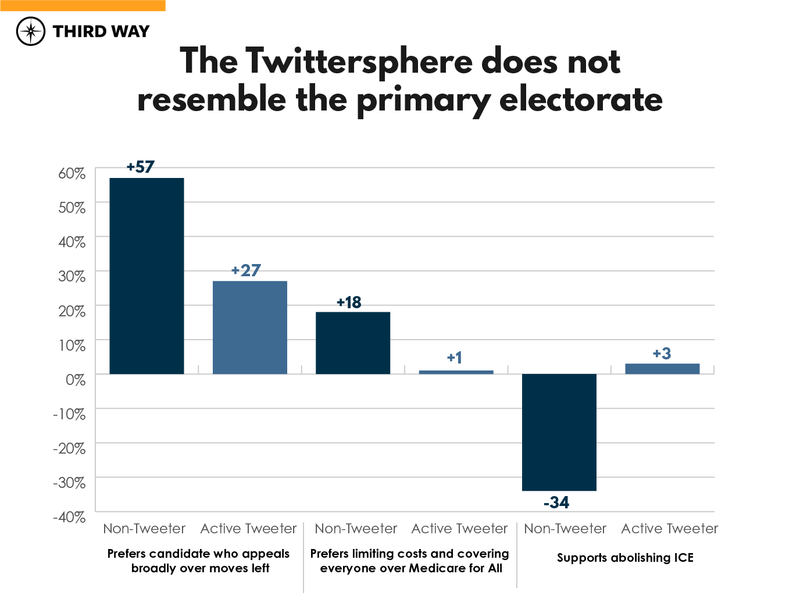 On abolishing ICE, voters who do not post on Twitter reject the idea by a 34-point margin, while active Tweeters support it by three points. Primary voters on Twitter may be paying outsized attention to the contest a year out from Super Tuesday (on average, just 17% of active Tweeters lack an opinion on candidates’ electability, compared to 34% of primary voters who do not post on Twitter). But Democratic candidates should take care to remember those Tweeters are a tiny slice of the electorate and do not reflect the pool of voters who will be making the real decisions at the ballot box—even in the primary. The Democratic primary will take many unexpected twists and turns over the next year, but the North Star for its voters will be finding the Democrat who can beat Trump. While the chief consideration for a candidate is their ability to win, they also want someone who is focused on urgent challenges, specifically: reducing the cost of health care, helping out working- and middle-class families, and addressing climate change. Democrats desperately want to win decisively in 2020, and voters believe that the way to do that is to build a broad, inclusive coalition that sends Trump packing. Third Way and David Binder Research partnered to conduct a national survey of likely 2020 Democratic primary voters. The base sample was 1,200 likely 2020 Democratic primary voters, and we also oversampled 250 African American primary voters and 300 Latinx primary voters. This gave a margin of error of 2.8% on the base sample. The survey was conducted online using a panel matched to vote history, in English and Spanish, from March 7–10, 2019.